A Massey University PhD student has chosen an unusual and little-studied subject for his history thesis: the development of rugby league in New Zealand from 1908-20. But 73-year-old Bill Greenwood is no ordinary student. The Lancashire-born Wanganui resident has completed a masters degree in history since retiring as a secondary school teacher. The thesis was the introduction of rugby league football into New Zealand's central provinces. For his PhD, Mr Greenwood broadened the subject matter to include the entire country and found a fascinating area of history that touches on the class divides, elitism and often bitter battle for supremacy in two of the biggest sporting codes that has barely been written about. Unlike rugby union, which has spawned almost as many books, biographies and almanacs as there have been All Black tests, league, in literary terms anyway, has been very much the poor cousin. Mr Greenwood found virtually all of his research depended on trawling though old newspapers from throughout the country. He says the development of league occurred in the face of an active campaign of opposition by the Rugby Union driven in part by this country's unique demographics. In the years between 1908 and 1920 the Rugby Union realised it could not afford to allow league to become the preferred rugby code of the working class, as had occurred in northern England and in Sydney. Had that happened, rugby union would have permanently lost its status as the country's national game. With its small and scattered population it was only in the four large cities that the middle class were numerous enough to possibly sustain rugby union competitions without working class players. To lose its working class players to rugby league would have meant that rugby union would have become a minor sport. ∑ Attempts to deny league players access to municipal grounds and keep the game out of schools. ∑ A propaganda campaign to (incorrectly) brand league players as professional sportsmen, and simultaneous flouting of rugby union's amateur rules to secretly pay players either to keep them in union or lure them back from league. Although it threatened to do so, the Rugby Union found it could not adopt the English policy of banning for life any union player who played league. It's not in the character of New Zealanders to be dictated to so if the Rugby Union had said 'you can't come back' they would have gone anyway and stuck with league, Mr Greenwood says. Another threat by the Union was to ban grounds used for league games from ever again being used for union games. Mr Greenwood says this threat too was largely hollow because to carry it out would have quickly reduced the available playing fields, most of which were owned by municipalities. However, it succeeded in persuading some councils against accepting bookings for league matches.New Zealand simply did not have the population to support a rugby code confined to the middle classes. The policy followed by the England Rugby Union once it accepted it had lost the working class of the north to league was to concentrate on trying to ensure league was kept out of the rest of the country. Similarly in Sydney, there was a sufficient population base for rugby union to abandon the working class to league and rely on middle classes to supply enough players through schools, clubs and universities. New Zealand was unique because league was introduced here throughout the country rather than to specific cities or regions and it was driven by rugby union players, who took part in a tour to Britain in 1907 organised by Albert Henry Baskiville and the 1905 All Black George Smith, and then returned the following year to promote the game. Despite the antipathy of the New Zealand Union, many working class players did try league but many also went back to union after a few games. To ban them from returning would have destroyed the dominance of rugby union, Mr Greenwood believes. New Zealand did not have the heavy industry and factories that produced the tight-knit working class communities of England's northern cities or Sydney. Many workers were skilled craftsmen employed in small establishments. Most towns were too small for the classes to lead separate lives and all lived in the same neighbourhood, attended the same schools, shopped in the same shops, attended the same churches and played for the same sports clubs. Auckland, with a population of about 100,000, was the success story of rugby league and successfully vied with rugby union, attracting as many players and even greater spectator support during the period. In 1908 teams from Southland, Otago and South Canterbury played each other in the South island, while the North Island provinces of Auckland, Taranaki and Wellington played one another. In 1910 the game was launched in Wanganui and Hawke's Bay and in 1912 half the Marlborough representative rugby team defected to league to play games against teams from Nelson and Wellington. But most big centres could support only a handful of clubs and smaller towns could barely field enough players for even one club. Mr Greenwood says claims the league players were paid were a myth. The only payments were daily allowances to touring players, as with union, and league did not have the support base to provide the money for under-the-table payments, unlike some of the big rugby union clubs, particularly in Auckland. Bill Greenwood was born in Lancashire, England, and grew up in a soccer-playing town, but discovered rugby league as a teenager in the 1940s. 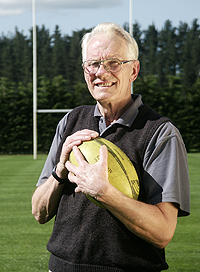 After moving to Wanganui in 1974, he became secretary of the Aotea Rugby League Club when it was re-established. He is studying at the School of History, Philosophy and Politics and his thesis is provisionally entitled The Impact of the Introduction of Rugby League Football into New Zeaand 1908-20.